It started with experiments in a garage in Sønderborg. 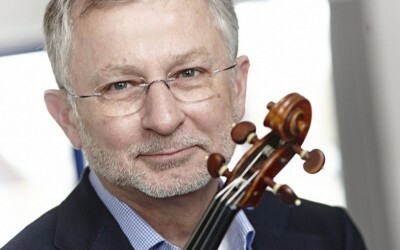 On 25 June 2015 Larsen Strings A/S is celebrating its 25th Anniversary as one of the world’s leading manufacturers of strings for bowed instruments. Back in 1990 Laurits Th. Larsen, then a violinist at the South Denmark Philharmonic, was contacted by a friend from the USA. The friend urgently needed some cello strings, but the delivery time from the producer was between 12 and 16 months. – “I spontaneously answered something like ’Don’t worry, I’ll make you some’. And that promise was the beginning of Larsen Strings”, Laurits Th. Larsen says. Laurits Th. Larsen worked hard to keep his promise, and after 18 months of experiments in the garage he was ready to present the result. At the beginning the production of strings was made on a 100 year old machine – since then development as well as production made a quantum leap. Not least due to the musician from Sønderborg who himself is behind the development of all the high technology machinery today producing Larsen strings for violin, viola and cello for the whole world. It is essential for Laurits Th. Larsen to underline the fact that for him the most important thing always was the personal relations in a branch demanding both a musical and a human good ear! “Worldwide less than 10 companies produce strings at the same level as we do, and – as we use to say – ’it’s all about people’. If there are no human relations in what we do – whether it is in development, in production or in the interaction with our customers and partners – we lose focus. When introducing new products we cannot sell a sound via the internet. We have to go out and meet our customers”, Laurits Th. Larsen says and he continues: “A good string could be compared with a tire – depending on the tire you choose, you can improve your hold on the road or your fuel efficiency, but as a string manufacturer the artistic goal is to create a string that gives the musician the highest degree of freedom to create his own expression.